LAST YEAR’S RUNNER-UP to Tiger Woods at the WGC-Accenture Match Play Championship, Stewart Cink opened play today with a win over South African Richard Sterne at Dove Mountain in Marana, Arizona. It wasn’t easy. The match went extra holes before “Stewie” knocked in a birdie with his long putter to win 1-up. He’s right. The road back to the finals will be challenging to say the least. 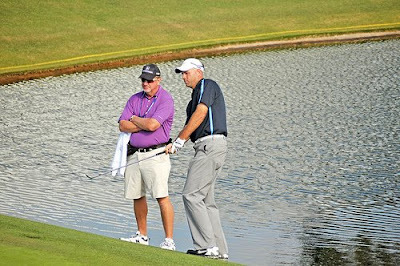 In the next match, Cink will face Lee Westwood in the loaded Ben Hogan bracket, which includes Vijay Singh (currently down in his match), Phil Mickelson, Ernie Els and Steve Stricker. Cink will need accurate approaches with his irons, but ultimately the flatstick will dictate the way his week goes. Stewart hopes to build on a solid year in 2008 in which he recorded seven top 10 finishes, including one win, two seconds and two thirds. He also played on the victorious U.S. Ryder Cup team. His interests outside of golf include sushi, skiing, hiking and ice hockey. Brought to you by The World of Golf and ARMCHAIR GOLF STORE. I love match play, but I wish I had one of those TVs that can divide into four separate screens with a match on each one. Love that Mr. Cink is Twittering his thoughts. Very cool find.